Coral Harbour Base, (RBDF) - An ongoing search for additional migrants is currently being conducted after several Haitian migrants were apprehended in a combined effort between Police, Immigration and Defence officials early Sunday morning. 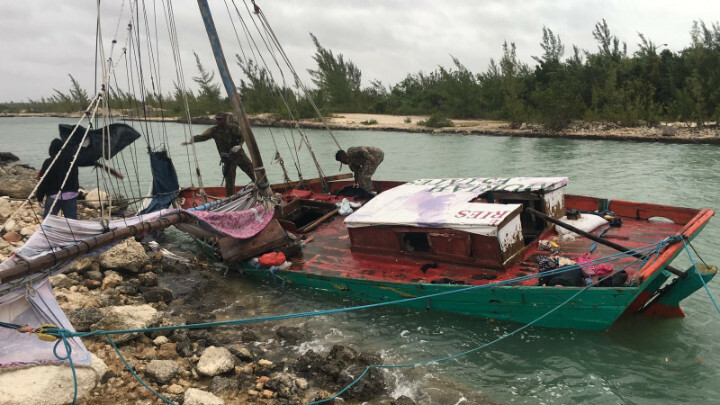 Shortly after midnight, a 35-ft a Haitian sloop made landfall off Venice Bay, South New Providence. Efforts by security forces resulted in the capture of 26 migrants, who were turned over to Immigration officials for further processing. Search for other migrants are ongoing. Altogether, the Defence Force had apprehended thirteen migrant smuggling vessels since May last year. The organization has also apprehended or assisted with apprehending over 1,000 migrants during the same period. The last landfall made by Haitian migrants on New Providence was in February of this year. Prior to this most recent incident, Marines were deployed to key areas along the coastline of New Providence in support of vessels patrolling offshore. However, much of the Defence Force's landbased, maritime and air operations have been hampered by adverse weather conditions over the past several days. The Defence Force is also conducting active patrols in response to reports received concerning various illegal activities occuring in the northern and southern Bahamas. These activities include overfishing by American sports fishermen, as well as mixed migrant smuggling in Grand Bahama, Bimini and the Abacos, in addition to reports of Dominican poaching in the southern Bahamas.